Now that the weather’s warming up, more people are leaving their cars in the driveway and biking to work. Cycling has many health benefits, like lower blood pressure and stronger muscles—that’s why many of our clinicians, like Dr. Mitchel Goldman, Dr. Brook Brouha and Dr. Shane Hamman in La Jolla, CA, choose to bike to work. Not only for the physical benefits, Dr. Goldman pedals to better health for the mood-boosting benefits as well. When participating in outdoor sports, like cycling, it’s important you take certain measures to protect yourself from the dangers of the sun. 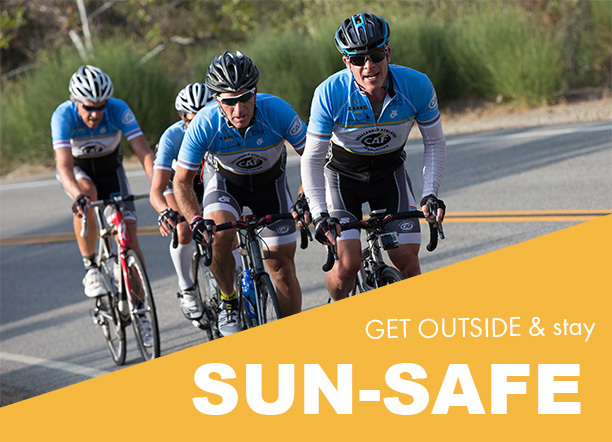 Though cycling and outdoor sports strengthen the body and mind, the related sun exposure can actually harm you. Over time, the skin can show signs of sun damage, including cancerous growths. Thankfully, cyclists and other athletes can reap the benefits of exercise with minimal risks by taking simple preventative steps. Choose the right sunscreen: You’ll want a broad-spectrum formula, meaning it offers both UVA and UVB protection. Pick something waterproof, so that you don’t sweat it off or rinse it away while swimming. Find sun-protective clothing: Look for UV-resistant clothing from your favorite athletic brands. The higher the UPF (ultraviolet protection factor), the more effective the fabric is. Don’t forget to add a hat and sunglasses, or a visor with your bike helmet! Pick a shady route: Trees and the shadows cast by tall buildings offer some protection against the sun. Apply sunscreen before you go: It takes 15 to 30 minutes for sunscreen to absorb into your skin and offer its full benefits, so apply it before leaving your home. Reapply: Put on more sunscreen every two hours, any time you get out of the water, or after periods of intense perspiration—whichever comes first. The health benefits of outdoor exercise are clear, and you can get those benefits without harming your skin if you make smart choices. Another great way to boost skin health? See one of our expert dermatologists in an office near you for a full-body exam and personalized skin health plan. Happy cycling!